The sloppy messes of winter will soon be here :( And those messes will be tracked everywhere, especially our cars. Whether your car is new or old, WeatherTech floor liners will keep your car’s interior clean, all year around. The tough, durable liners are laser measured to fit your car perfectly. The result is a stain resistant, easy-to-clean up floor surface that lasts for years. And when I say years, I mean 10+ years! Personally I have WeatherTech liners in old SUV that are going on 10 years and they still look as good as new. When they get a little messy, I simply spray them off and use some degreaser on stubborn spots. It’s so much easier than scrubbing carpet fibers that have been flattened and worn down from frequent foot traffic! The great benefit from the liners is apparent during the winters! Snow and ice melt and stay self-contained. Ice melters and rock salt do not damage the liners, so no stains and no “crusty” residues are left behind. Simply spray and wipe them clean as needed and you can expect years of dependable use! For more information and samples of the WeatherTech materials, please stop by our in-store display. We show an example of their floor liner which is the one discussed in this article, and by far the most popular car solution that they make. We also have an example of their all-weather floor mats. These floor mats provide a more soft and supple solution to keeping your car’s interior clean. 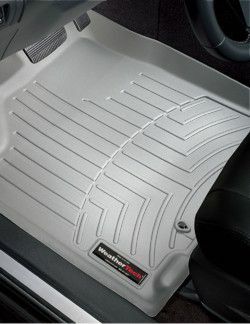 So if you are looking for a better way to keep your car clean this season, or just in need of new car mats, then consider the ultra functional WeatherTech floor liners.